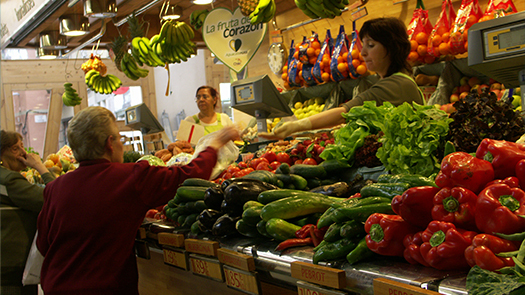 Barcelona boasts the biggest network of municipal markets in Europe, with over 40 food markets and 6 non-food markets. The importance of the modern market in Barcelona dates back to the 19th century when the first covered markets were built. Since then, markets have come to be thought of as vital public spaces. Each market has its own story, unique architecture, and often its own specialty. Santa Caterina is both the oldest covered market in Barcelona and one of the most modern. Originally built in 1848 and reopened in 2005 after a massive seven-year renovation project, this market is simply enchanting. During the rebuilding process, the foundation of a large 19th century convent was uncovered. This led to further investigation, and archaeologists then uncovered the ruins of a Gothic church from 1241 and then the remains of a late Roman necropolis. A section of these archaeological discoveries are on display. The new building stands out for its curved and colorful roof, which is representative of the lovely fruit and vegetable stands contained inside. Right in the center of Barcelona, near Santa Església Catedral Basílica de Barcelona (La Catedral), this market is a great place to see what Barcelona markets have to offer without being overwhelmed by tourists. Santa Caterina Market, in many ways, is representative of the city itself: the historic and modern side by side, all pieces of the same puzzle, as though it were planned that way from the beginning. Don’t miss the adjoining restaurant, Cuines Santa Caterina, which serves excellent local and international dishes made with market-fresh ingredients (no English menu). One of the most photographed sites in Barcelona, this market is known for much more than its fruits and vegetables. La Boqueria is the largest market in Spain and a must-see for anyone walking down the city’s main pedestrian strip, the busy La Rambla. It’s the traditional place to buy saffron and Spanish paprika to bring home, and the endless variety of candy will make you want to come back. La Boqueria opened in its present form in 1914 and today has a wide range of local and international products as well as various tapas bars. Keep an eye on your wallet here (like on the rest of La Rambla), especially if you’re buying something, because pickpockete will be keeping an eye on it too. Mercat Sant Antoni is one of our favorites, though the original structure is currently under construction for a renovation project. In fact, the date for reopening has been pushed to late 2017, as architectural remains have been discovered. They will be preserved and showcased in a museum within the renovated space when the market reopens. For now, a provisional food market has been set up on the Ronda Sant Antoni that continues to draw from the neighborhood. The unique Dominical de Sant Antoni (the Sunday morning fair with second-hand books, magazines and collectable odds and ends) will continue to be held under the exterior canopy of the original Sant Antoni market. This is worth the trip, a wonderful slice of local life. Sant Antoni market may not be as glamorous as La Boqueria or Santa Caterina Market, but it is an architectural gem. Its renovations will only make it moreso. Stay in an apartment in Barcelona so you can enjoy food shopping in the local markets.